Hi! 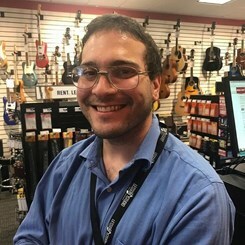 My name is Michael, and I work here at the Wayne Music and Arts. I enjoy playing the ukulele, saxophone, and singing. I also write and record original songs under the name Chrono Uke. I started playing the saxophone in fourth grade, and I've been playing the ukulele for eight years. Music saved my soul. I studied Theater at Marymount Manhattan College, with concentrations in Acting and Playwrighting. In my spare time I make short films. Stop by soon and talk with me about music or something unrelated to music!